- Pool area: closed veranda, equipped summer kitchen, washing machine. Solar shower and toilets with hand basin. Flat land with terraces (the largest to the South and North) and lawn, pool gated by electric roller cover and wooded garden: palm trees clumps, Neriums and young and mature fruit-trees. In summer, sun umbrellas, sun loungers and deck chairs, dining area can also be moved. Gas barbecue. Garden with shaded and enclosed car park. The kitchens of the house and veranda on pool side are each fully equipped: induction hob, multifunction oven, fridge, dishwasher, kettle, crockery and serving dishes. Kitchens, bedrooms and bathroom offer a lot of storage space. -To the South, there is a bathroom with a large bathtub; the bowl sink is built in a wide and practical vanity unit. The bidet remains very useful for the younger ones. The travertine floor feels nice on your feet and isn't slippery. If you half open the door while you're washing, the mirror wall will reflect the palm tree clump of the large palm tree in the entrance, and you will be in the middle of tropical vegetation! You can store your belongings in closed wardrobes. Electric towel rail. - To the North, opening onto the ancient pine wood, the shower room has just been renovated. It boasts one walk-in shower with, on the floor, a camaïeu of golden and sweet flat stones, a wash basin and toilets.There are cupboards and shelves for storage. Electric towel rail. - Outside, on the pool side, the shower is hot (solar), soap available: the water drains off used water. The toilets have a hand basin. - For young children: Pool entrance at shallow end of 3 sq.m with 30 cm of water (Adults enjoy this as well!). If you wish, we can place a sand pit with some toys, small cars for children, scooter and small bike, a deep cloth baby cot, several potties that can be placed on the toilets, foot stool and high chair. - In the entrance hall, you can leave your beach stuff and you will find in the library books, newspapers and some board games. - The house kitchen boasts a multifunction food processor and a toaster; both kitchens are equipped with an induction hob, an extractor, the same multifunction oven, a coffee maker and a kettle. - Notes: The paintings, equipment and furniture are often new (2010-2011); the pool was rebuilt in 2010. And, for your pleasure, you can catch glimpses of the sea from the gate or the living room and the dining room will allow you, every morning, to check that the sea is still there and remember what colour it is!!! Beautiful villa, quiet and relaxing. Right from the start of our booking, the owners were extremely helpful and sorted out insurance etc for us. The owners friend greeted us when we arrived and brought her nephew along as he spoke very good English! The villa was beautiful. It had secure parking for our Motorbikes which was very important although the area was very quiet and peaceful. The pool was lovely and the kitchens had everything you would need. We enjoyed the stroll into town in the evenings for dinner and breakfast on the balcony in the mornings. If we ever return to St Rapheal in the future we would definitely stay there again. "Dès le début de notre réservation, les propriétaires ont été extrêmement aidants et ont arrangé pour nous les questions d’assurance etc. L’amie des propriétaires nous a accueillis à notre arrivé et a amené son neveu car il parlait un très bon Anglais ! La villa était belle. Elle avait un parking sécurisé pour nos Motos ce qui était très important bien que le quartier fût calme et tranquille. La piscine était charmante et les cuisines avaient tout ce dont vous pourriez avoir besoin. Nous avons apprécié flâner jusqu’au centre-ville le soir pour dîner et prendre les petits déjeuners sur le balcon le matin. Si nous retournons à St Raphaël à l’avenir nous reviendrions certainement là à nouveau." My Husband, Sister and Brother-in-law were lucky enough to stay here for a week in June with our 11 month old Son. The villa, pool and garden areas are beautiful and extremely well kept. Our Son loved playing in the pool and sand pit. The layout of the bedrooms makes sleeping arrangements very flexible so children of all ages can be accommodated for. 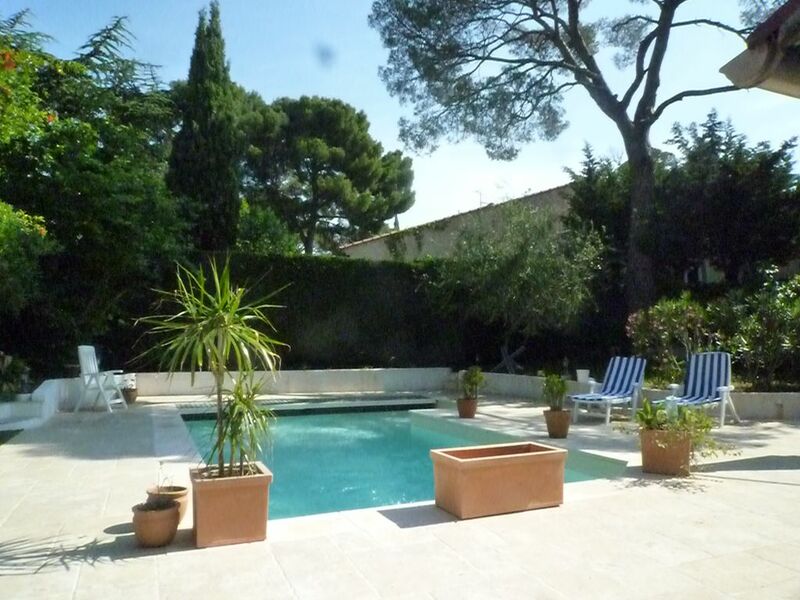 Both kitchens are well equipped for a self catering holiday and the location is perfect for exploring the Cote d'Azur. We took day trips to Monaco and St Tropez but there is so much more to see and we wish we could have stayed longer! The owners were extremely helpful in assisting us with our booking and ensured that everything was organised for our arrival, including a travel cot, sheets/towels and a high chair - a few less things to worry about make all the difference when taking children abroad!! I must also mention the owners friends who met us at the villa - what wonderfully friendly and helpful people! This was our son's first holiday and one which will always provide us with very happy memories. We would highly recommend this property! Nous avons passé deux semaines agréables sous le soleil. La maison est proche du port de Santa Lucia et pas trop loin du centre de St Raphaël. Le quartier est extrêmement calme, le jardin reposant. Nous avons bien profité de la piscine. Nous avons été ravis de vous avoir comme hôtes. Vous avez inauguré un four multifonction nouveau ;-) , vous l'avez fait très gentiment et avec grand succès! Merci et bravo! Nous sommes restés 1 mois dans un cadre de vie fort agréable. La maison est spacieuse et fort accueillante, située idéalement proche du port et des criques, sans être trop éloignée du centre ville, dans un quartier extrêmement calme. Les chambres et les pièces a vivre sont aménagées avec beaucoup de gout. La période était encore un peu précoce pour profiter de la piscine, mais le jardin est très agréable et reposant. L'accueil de Mme Fleys est parfait, nous mettant a l'aise pour tout le séjour. A recommander pour toute vacances, famille ou amis, une très bonne adresse et de merveilleuses personnes. We stayed at the villa for two weeks this July and it was an amazing holiday. The villa has everything you could want and the pool is perfect with many kids toys. The layout is child friendly and with a kitchen by the pool we were rarely indoors. The location was also great as it was a short walk to the shops and many beaches too. The owner provides wifi for those needing to check work and the villa was air conditioned. Would highly recommend it. Many thanks. Dear Jane, I hope all of you are at their best. Please, may I translate your comment as it is interesting for holiday makers? Many thanks. Best regards. Villa 800 m away from the sea, the port of Santa Lucia with shops, restaurant terraces and nautical club; bathe in the Rochers Rouges. 400 m further: fine sandy beach. Town centre and TGV train station 1.2 km away. 2 hypermarkets 2.5 and 3.5 km away with easy access. Saint-Raphael, in a large bay, is lively in all seasons. The charm of its Old Town, its small fishing harbour, shops and cultural facilities, and en suite, for strolling, the elegant Marina of Port-Frejus, the Roman Frejus and its remains (bullrings, theatre, aqueduct) and the picturesque Provencal Frejus (alleyways, plane trees, museums, cathedral and medieval cloister). gorgeous golf course in the pine woods. 4 km away, you will already be at the entrance of the Esterel Massif with its red cliffs. Golf: Saint-Raphael is the golfers' paradise. 4 golf courses (4 or 6 km from the villa) amongst umbrella pines: 2 golf courses of 18 holes, of which one is centenarian, and 2 courses of 9 holes that offer new shapes. Several prestigious events take place in summer. - Valescure Golf Course - 18 holes (since 1895, the design has the British golf course style) and sauna, tennis, archery. - L'Esterel Golf Course - 18 holes, golf courses of 5852 m, international golf superbly carved in the middle of a generous nature. Pretty water features. Restaurant (quality regional food) and terrace. - Academie Golf Course - 9 holes, beginner course of 1456 m. From 6 years old. Wooded. - Cap Esterel Golf Course - 9 holes, golf course of 1580 m, effective initiation or improvement and qualified instructors. Gorgeous rolling and narrow golf course with view over the red cliffs of Esterel and the Agay bay. Tarifs de 980 euros à 1980 euros par semaine selon la saison. La caution, espèces ou chèque, varie selon le montant de la location, 1000 € en très basse saison à 1500 € le reste de l'année. Eau: incluse. Électricité: incluse pour un forfait confortable de 15 KWh par semaine.Si il y a dépassement (rare) il est à régler (pompe à chaleur plus économique) Possibilité de location de linge de maison et de ménage. La location se fait du Samedi 17h au Samedi 10h (sauf accord préalable). Les arrhes seront de 40% à la réservation et le solde sera versé selon le contrat (à voir) et le moment de la réservation.